An alternative cast in Le Corsaire at La Scala made waves with Martina Arduino and Mattia Semperboni especially noteworthy. 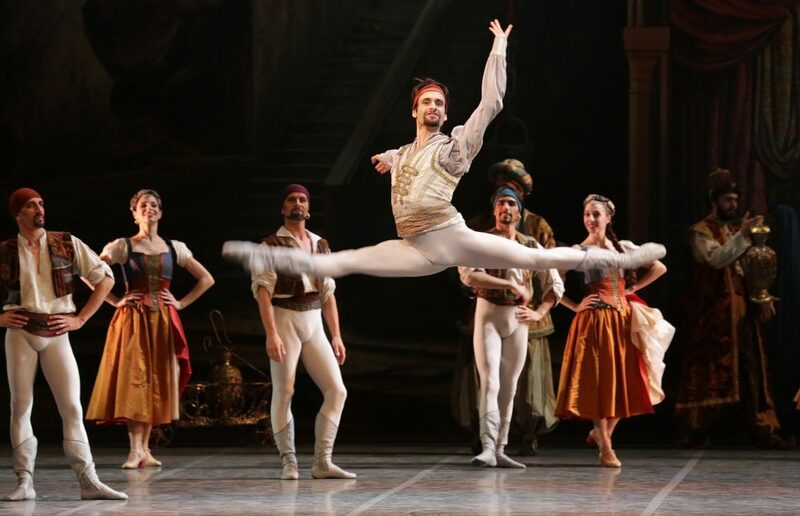 The success of Le Corsaire’s first night cast at La Scala was reviewed here previously, but no less was an alternative cast which had a shining beacon in Martina Arduino as Medora. She is a lovely dancer who was thrust into the spotlight when Alexei Ratmansky plucked her from the corps — she was not even on a permanent contract — and cast her as his Odette/Odile. She was just 19 and fresh out of La Scala’s Ballet School; that was two years ago. She has since been promoted to Principal Dancer, and in the last couple of years has come into her own on La Scala’s large stage and she has a winning way with the audience. In Le Corsaire she was radiant and secure, both as a stage personality and as a dancer: she was deliciously flirtatious with the Pasha, showed great aplomb during the pas de trois while continually making eye contact with her two partners, and in the bedroom pas de deux she was soft and engaging. Nicola Del Freo, who was her Siegfried in Swan Lake, played the slave trader Lankendem. He is a fine dancer who can be exciting to watch but his often-reticent character means some his bravura goes unnoticed. Maybe it was the facial hair, or the swashbuckling nature of the role, but here his eyes were flashing, and his grin stretched from ear to ear, and he looked thoroughly happy to be on stage. A dancer who always stands out is Emanuela Montanari, who many around the globe will know from Sylvie Guillem’s farewell tour when the two dancers performed the female duet Here & After created especially by Russell Maliphant. A gorgeous Catherine Zeta-Jones lookalike, she radiates warmth and good humour, and is also a talented actress. Her acting talents weren’t stretched to the limit as Zulmea, one of the Pasha’s favourites, but she was commanding and fiery, especially in the second act pas de six. Virna Toppi as Gulnare is spot on for her presentation of the character but her technique doesn’t always convince, something she herself seems to know – we can see it in her eyes. And whether it was the fault of the costume or not, there was far too much of a slow-motion knicker display during the adagio of the pas de deux with Lankendem. Caterina Bianchi and Agnese Di Clemente also looked terrified during their diagonal together and during their turns during the odalisques’ pas de trois. The audience sees everything! They are good dancers and smile charmingly during less frenetic passages, and Caterina Bianchi is very secure technically, so they need to follow the example of the more experienced Vittoria Valerio who was serene and confident throughout. Marco Agostino was a noble, macho Conrad, and Federico Fresi as Birbanto executed some exciting mid-air flips, but it was Mattia Semperboni who once again brought the house down as Alì, the slave. He was supremely assured having replaced and injured Claudio Coviello in the first cast and consequently danced in almost all performances. He admirably resisted the attention to overdo things and was always in control – the excitement came from his virtuoso chutzpah not by him taking dangerous risks. His beautiful jetés seemed to float even longer than his earlier performances and his landings were apparently weightless. A real crowd pleaser. Now we need to see him in more artistically demanding fare.